In Colorado and across the west, there is overwhelming bipartisan support for responsible oil and gas development. It’s no wonder, therefore, that “Keep It In the Ground” groups are left with only bad theater, political stunts, and threats to make their case in the west. 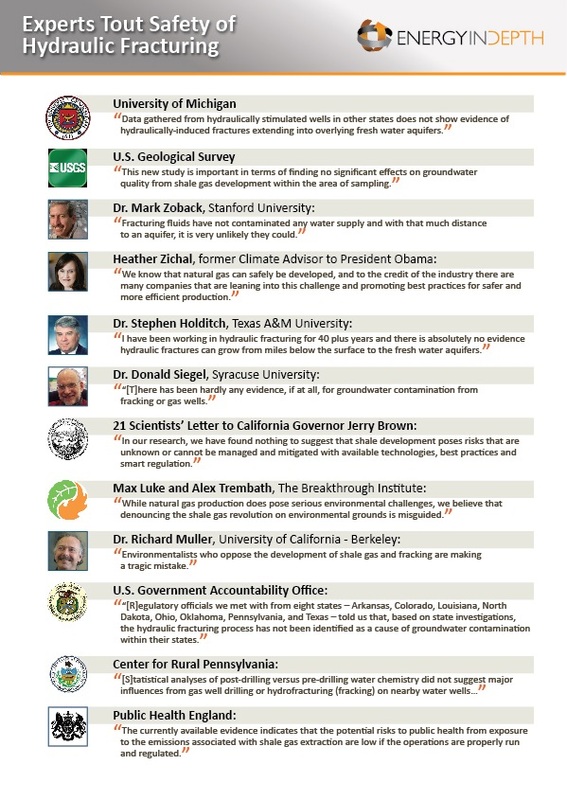 As we close out 2017, here’s a quick recap of the 10 most outrageous “ban fracking” stunts ranked by most ridiculous to still pretty ridiculous. Knock knock. Who’s there? Not Boulder County Commissioner Elise Jones, because she doesn’t live here. 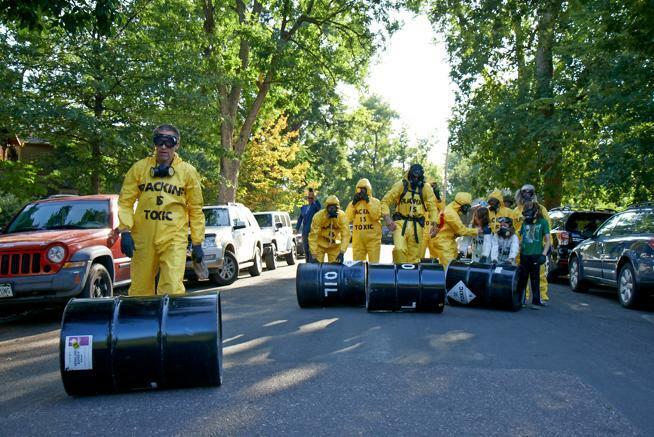 That’s what happened earlier this year when anti-fracking activists staged a nearly hour-long protest at the wrong house in Boulder, Colo. This fiasco takes the cake as the top 2017 anti-fracking stunt that will never be lived down by these “Keep It in the Ground” groups. See videos and photos below for a quick refresher on what is likely the biggest anti-fracking PR disaster to-date. Source: East Boulder County United Facebook. Click here for the full video. 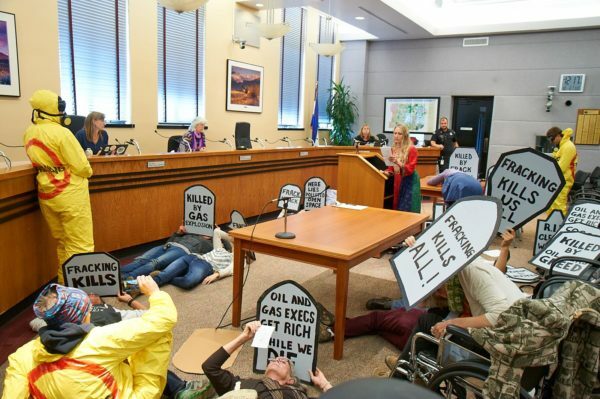 As if the “Wrong Door” protest wasn’t bad enough, the same group of activists staged a tone deaf “die-in” targeting – yet again – the once-praised Jones, who has now found herself on the anti-fracking group’s political hit list. And, if you haven’t heard of a “die-in” before, as strange is it seems – this is actually a common protest tactic used by “Keep It in the Ground” groups. Considering they have secured the top three spots on our top-10 list so far, it’s pretty clear that 2017 was all about “bad PR is good PR” for these Boulder fracktivists. 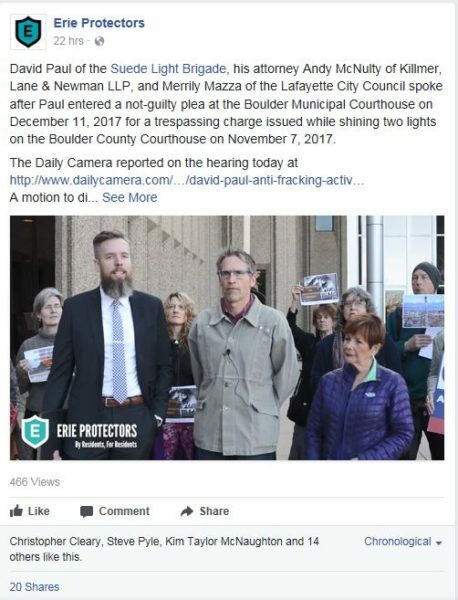 Par for the course, Lafayette City Council Member Merrily Mazza (a press contact for EBCU) skipped what you would think is a more important city council meeting in favor of taking a 3,281-mile round trip to Ohio for a speaking tour to market her “success” in Colorado. 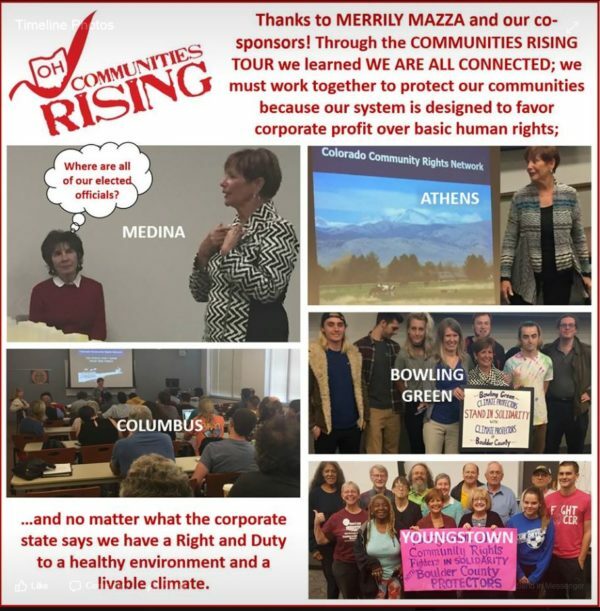 As our EID team in Ohio discovered, she was actually touting the passage of Lafayette’s “Climate Bill of Rights.” Ironically, both Mazza and her son Cliff Willmeng were not exactly thrilled about the measure that passed earlier this year, calling it “toothless.” But that clearly didn’t hold Mazza back from her “Community Rising” speaking tour in Ohio where she shamelessly promoted her heralded victory of passing the “toothless,” “unenforceable” and “unconstitutional” “Climate Bill of Rights” she championed in Lafayette. It was no surprise to see D.C.-based national anti-fracking group Food & Water Watch (F&WW) at basically all of the Colorado Oil and Gas Conservation Commission (COGCC) meetings this year. Also not surprising was the outrageous performance given by the following F&WW operative during the November COGCC meeting in Denver. 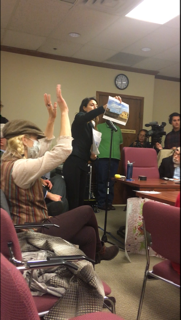 During the November meeting, the above pictured F&WW operative passed around medical masks and instructed other activists to decorate their masks with anti-fracking rhetoric meant to symbolize the “toxic” air in Colorado caused by what one reporter called “oil fracking,” whatever that is. Decorating masks and wearing them at a public meeting and expecting to be taken seriously is odd, but what was even more embarrassing for these activists is the fact that they cited several debunked studies and misinterpreted reports during public comment. See below for a few examples. One activist referenced the American Lung Association’s (ALA) annual air quality reports, which have long been debunked not only by Energy In Depth, but by state air regulators, EPA officials and the local news media. In a 2015 follow-up interview with Energy In Depth, CDPHE Air Pollution Control Division Director Will Allison revealed that the ALA report card ignored a full year of air quality data from 2014, which shows ozone levels getting better, not worse. For then-ALA of Colorado vice president Cindy Liverance to claim there’s higher ozone now than back in the 1970s also ignores decades of air quality data that show “it’s gotten a lot better,” according to Allison. This clap back at ALA isn’t unique to Colorado. Widespread criticism of the ALA reports has poured in from across the country in recent years from the Pittsburgh Post-Gazette’s editorial board, as well as government agencies and regulators like EPA Region 7, the Indiana Department of Environmental Management, Maryland Department of the Environment, Texas Commission on Environmental Quality and Hamilton County Department of Environmental Services. Consensus shows that ALA is misleading the public by misrepresenting information in an effort to advance its agenda. Nevertheless, anti-fracking activists continue to rely on these reports, despite the fact that ALA’s data is faulty and inaccurately aggregated. Fracktivists exploited a conveniently timed National Center for Atmospheric Research (NCAR) report. The morning of the November COGCC meeting, the Boulder Daily Camera reported just 35 minutes before the meeting started that a “new air quality report” had been released that same day by Boulder’s NCAR. Coincidentally, news of the “new report” came out around the same time that nearly 60 anti-fracking elected officials and activists were lining up at the doors and signing up to give public comment for the 9 a.m. COGCC meeting. #5 Anti-fracking activists are multi-faceted. Not only can they put on lively theatrical performances, but some of them can sing! You’ve been warned, watching this video may result in this song being stuck in your head, as it is quite catchy. Anti-fracking activists over in Boulder County hosted a press conference in front of the Boulder County Courthouse regarding a recent incident in which activists tried to show people “the light” as it pertains to fracking, but instead one of the anti-fracking protesters ended up lit with litigation instead. Sometimes, politics start in the courtroom. Earlier this year, the Colorado Court of Appeals sided with youth environmentalists in a lawsuit against the state’s chief oil and gas regulators, the Colorado Oil and Gas Conservation Commission (COGCC). To be more specific (something the media failed to do) the court sided with youth environmentalists backed by national activist groups that have a track record of using kids to get press attention and lobby the state legislature. Despite those headlines, the parties involved and the attorneys arguing the plaintiffs’ case clearly showed who the real players are: 350 Colorado, Sierra Club, Earthworks, Food & Water Watch (F&WW) and F&WW-affiliate Frack Free Colorado – the same national groups that have tried to masquerade their national political campaign as anything but a national political campaign in Colorado, one failed media stunt at a time. Just as this lawsuit is part of the same old “ban fracking” campaign, these same old groups involved are using familiar attorneys to argue their case. For instance, attorney Julia Olson founded Our Children’s Trust based on “[t]he idea of having children front the campaign” against climate change and “the idea of signing up multiple children to be plaintiffs in the various lawsuits,” according to E&E News. The group partners with Greenpeace and Sierra Club. Sierra Club, Earthworks, and F&WW have already taken their “ban fracking” agenda to the courts in Colorado – and lost. Twice. 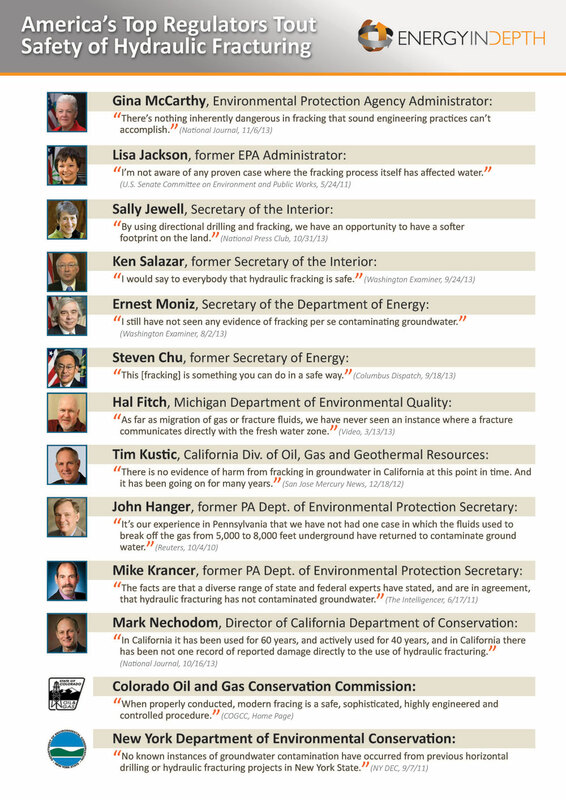 Last summer, 350.org, F&WW, Greenpeace, Sierra Club, and a host of other national “ban fracking” groups failed to collect enough signatures to put anti-fracking measures onto the state ballot. The Supreme Court has yet to decide whether or not to take this case up for review. Anti-fracking activists had a bit of an odd obsession with Nevada this year, considering the state has barely any oil and gas production and relatively few prospects for future production. Nonetheless, the first “Keep It In the Ground” operative to swoop into Nevada this year was billionaire activist Tom Steyer, who sponsored a “ban fracking” bill during Nevada’s legislative session. Steyer’s efforts were met with demise when the “ban fracking” bill failed to pass out of committee in the state senate. With the Nevada legislature out until 2019, the usual anti-fossil fuel suspects, Sierra Club and Center for Biological Diversity (CBD), were on a “search for water in the desert” over the summer when they filed a lawsuit challenging the U.S. Bureau of Land Management’s (BLM) June sale of oil and gas leases in Nevada. Several studies have concluded that fracking is not a major threat to drinking water. After five years of research, the U.S. EPA released its final study earlier this year on fracking and groundwater and found no evidence of widespread contamination. As for greenhouse gases, EPA released its 2017 final Greenhouse Gas Inventory and the data clearly shows that methane emissions from both natural gas and petroleum systems have declined significantly since 1990. These emissions also decreased from 2014 to 2015 – at a time when natural gas production hit record highs. U.S. carbon emissions have fallen 14 percent since 2005, reductions expert after expert have largely credited to increased natural gas use. But despite these facts, these “Keep It In the Ground” groups keep on flat out denying science. Well that never solves anything. 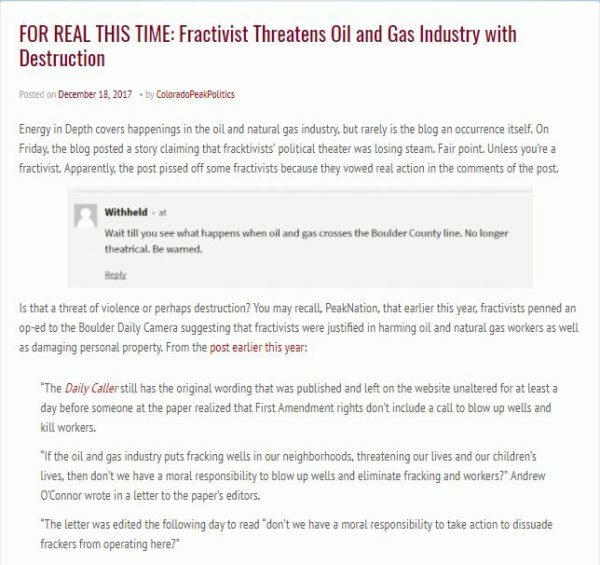 #10 Let’s not forget the threats issued by anti-fracking activists. Those are bad. It’s no surprise that activists have had to use gimmicks and extreme rhetoric in their crusade against fracking, given the long list of regulators and energy experts who have repeatedly backed the safety of the process. In spite of anti-fracking theatrics, the fact remains that fracking is reducing emissions and driving economic growth.